We’re there, all het up and it’s finally official: pre-orders are available! 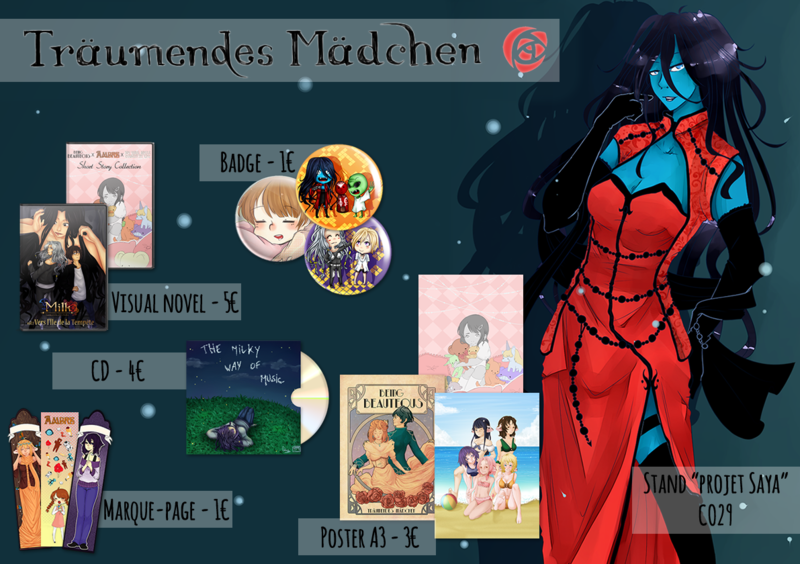 The Träumendes Mädchen team will be at the Japan Expo convention in Paris from 2nd to 5th July (booth L52, Hall 6) with a sack full of things. In order to celebrate that, here’s a description of our new products. 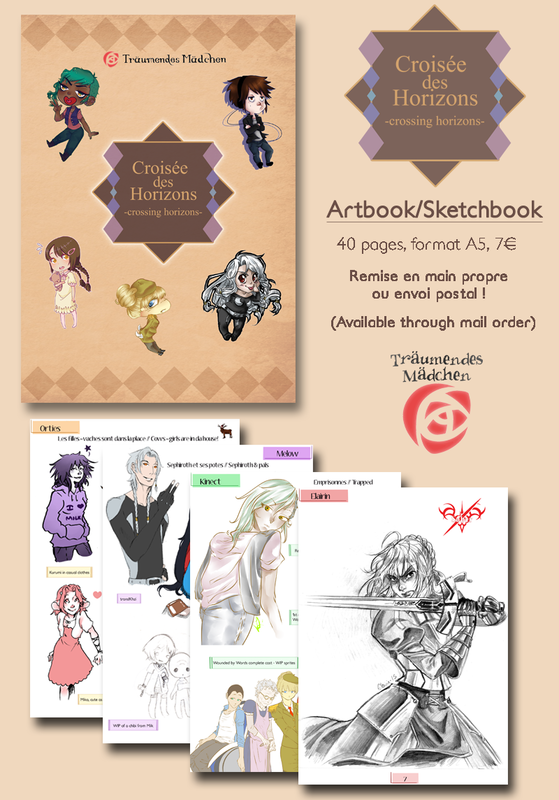 The Crossing Horizons sketchbook will be in A5 format and will include around 40 pages shared between all the artists on the team.As you might already notice on this preview, there is a little bit of everything: fanarts from visual novel (japanese or western), illustrations of our own games (abandoned sketches we never showed or new ones drawn for the occasion), sometimes in black and white, sometimes in ful color, digital or traditionnal. In short, a joyful jumble overflowing with passion! If Elairin, Kinect, Melow and Orties are in the spotlight, Morsy and Laniessa also offered a contibution and we’re really happy to count a small Guest Art section as well at the end of the artbook. All to say we put our heart in it and we hope you will enjoy the result! 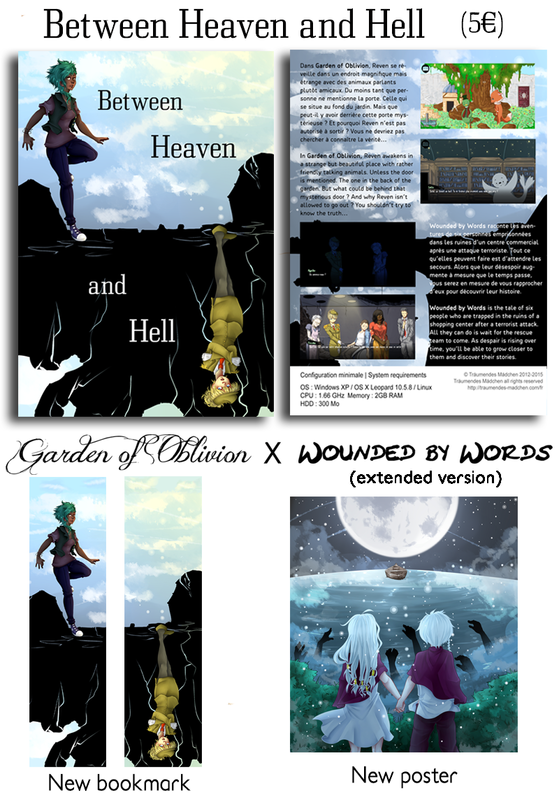 The new hard copy, named Between Heaven and Hell, will include a compilation of Garden of Oblivion and Wounded by Words.Translation of the original content in French is almost finished so I’ll be able to write the new content for WbW extended version pretty soon (after story for each route and unlockable epilogue)…as well as the secret bonus. 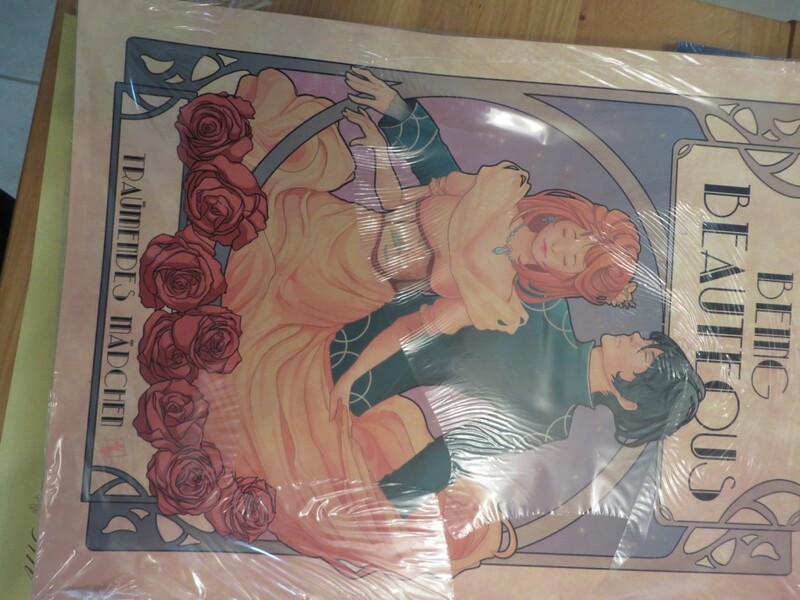 We also have two new merchandises: a bookmark and a poster! _and don’t forget to tell me what you want to buy, of course! We only accept Paypal payment (same email). And don’t worry about the change, I’ll do that for you and tell you exactly how much it cost (but FYI 1€ = 1,12$). So that’s it, thanks for the constant support, we wouldn’t be able to do all that without you! 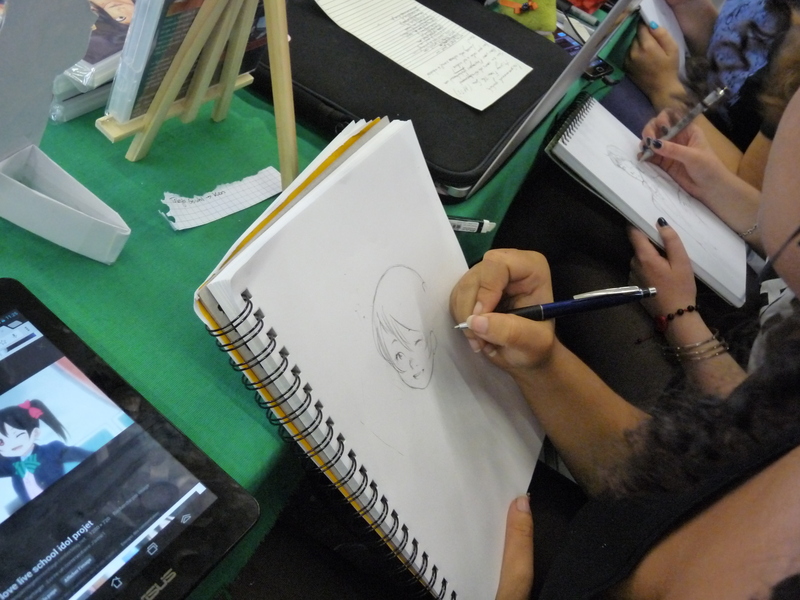 Japan Expo 2015: Action stations! Since June is coming by, now is a good time to talk about Japan Expo. If you don’t know, it’s the biggest French convention and we’ll be attending this year again. So here’s the list of the new products we’ll be selling. We’re currently translating that content to French, hoping that we’ll be finished on time. The goodies from last year are back! 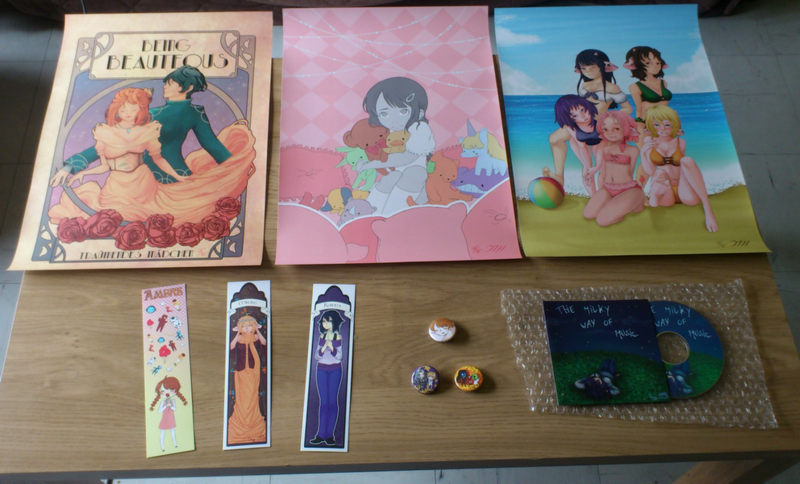 We did a little survey at the beginning of the year and the goodies that had the most success were the bookmark and the poster. 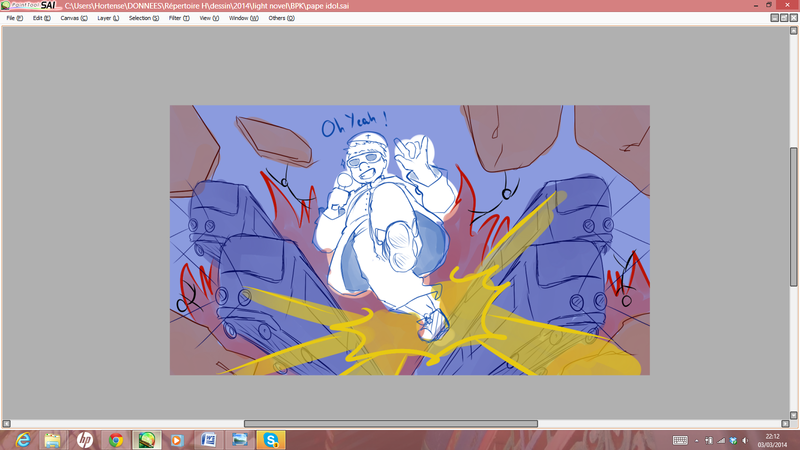 So I think I’ll make a new bookmark inspired by the new compilation cover. As for the poster, it’s a little more complicated: I wanted to use the Styx CG from Milk Episode 4 but the size of the required file is really big. We’ll only be able to know if we can do that after some tests. We’ll keep you up to date. 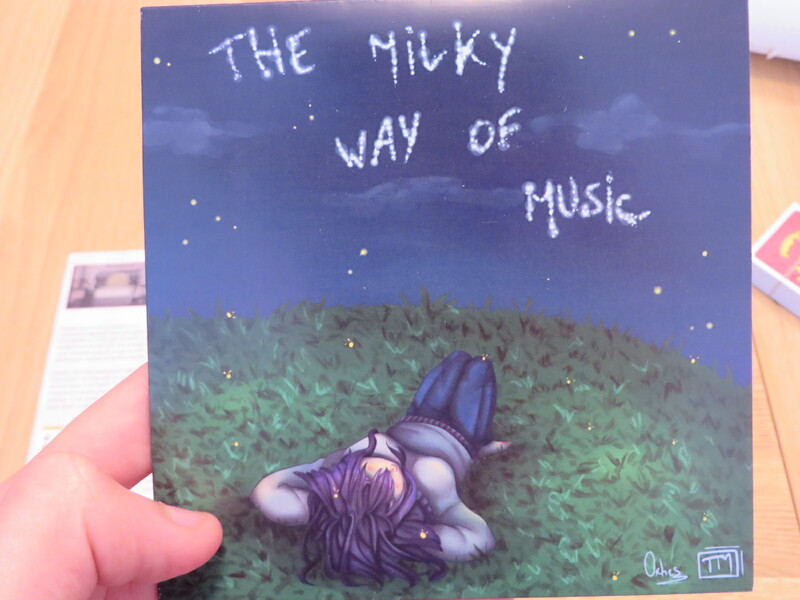 It should also be noted that Roganis won’t make a new music album this year but his last one, The Milky Way of Music, will still be available, as well as last year goodies! Only preview available for now…but this is gonna change pretty soon! Our biggest challenge for Japan Expo is the artbook aout visual novel we want to make, our first one at that! The conception phase wasn’t easy but we’re slowly seeing the end of the tunnel. We need to make the cover as well as four pages…out of the 40 or so planned (A5 format). In order to make you drool a bit, we’re going to post previews of each artist’s work along the week. Since 2014 was our first time in a convention, we obviously learned a lot since then, that why we’ll have a bigger booth this time (that we’ll share with the same lovely dev as last time) and we’ll try to make effort on the decoration. We’ll also make a lottery : for each purchase on our booth (amount to be specified later), you’ll be able to try your luck at the lottery and win a prize. And you can only win something! You might think that it doesn’t concer you, right? But this time, we’ll try a pre-order system. Even if you don’t live in France, you can book/buy a product and we’ll put it aside to ship it later. Since some items will be limited, they might get sold out very quickly though, so don’t wait after the convention to see if there is still some left! We’ll be opening preorders pretty soon, in a few days actually (with full informations), so keep your eyes open and follow us on social network to be the first one served! I hope you’re impatient, because we sure are ;). P.S : Should be noted that people following my Patreon will be able to book a little earlier than the others (and already get some artbook previews). That’s how it is XD. Following our 2014 report, which says we did LOTS of stuff, the Träumendes Mädchen team won’t stop just now. So what do we plan to do in 2015? To begin with, slow down a bit X). I think it isn’t healthy to produce four games a year, not only does it lead to irrealistic expectations, but it also push the teammates to exhaust themselves. We can hardly beat 2014 record in terms of productivity anyway and I don’t want anyone to drown in a coffe’s cup (would be a fitting death but no). Some of you may be wondering if we gonna take part in next Japan Expo convention. Well, the answer will depend on you! Since we’re a team of hobbyists, we don’t have a big budget and we’re paying transports/accomodation cost out of our own pocket. We’re enthusiasts and we want to be sure we’re going to make you happy. So I gonna circulate a survey to know if some people are interested in last time hard copies (if we need to reprint some) and if some people are interested in new goodies. Depending on what answers we got (as well as the numbers of answers we got), we’ll be able to see more clearly into it. Of course, most international people won’t be able to attend a French convention, but please do let a comment (here or through social networks) if you’re interested in mail-order. I can’t garantee anything for now but we might be able to open an online store in the future. 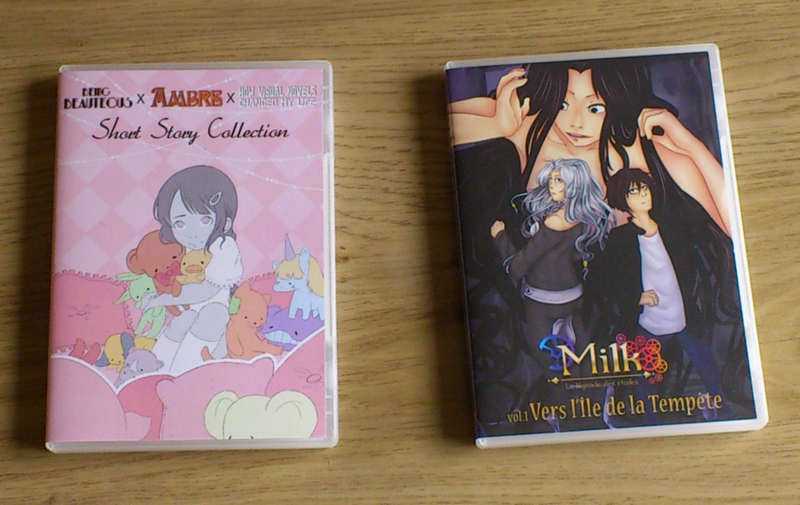 Beyond Japan Expo, I think it’s reasonable to make progress with Milk Episode 5. I really hope this part will be available before the end of the year because it’s urgent to finish the common route once and for all. Or else we’ll still be making the rest 10 years from now and that doesn’t sound that tempting to me =(. 2015 will be more relaxed…maybe? To conclude, 2015 should be less hectic than 2014…should be. Because, as I said, we’re not immune to surprises ~ You know me, I can’t stop myself. Let’s bring 2014 to a close with a little report of everything that happened this year (like what we did last January). To begin with, we released Episode 2 from Milk ~La légende des étoiles during mid-March. It was a bit hasty to my taste since we were late in relation to my estimations, and we had to rush through the release to tackle the next task. Which is a shame and I really don’t want the same mistake to recur. The good news is that with Episode 2, Milk was officially heading towards Khzi’s part that I loved to write and that contrasts a lot with what I wrote for Episode 1. The cows and Tarô aren’t the main characters anymore and just accompany the long story narrated by our nutty alien. I think Khzi has everything to be popular and the various feedbacks I got confirm that impression. Freyja seems to have fans too, I find that amusing XD. The key element with this release is essentially our transition to the current team (who gained experience during the journey). We still have a big gap between the art assets but we’ll solve the issue in due course. The current style should stay at least for a while even if we’re not immune to something unexpected. 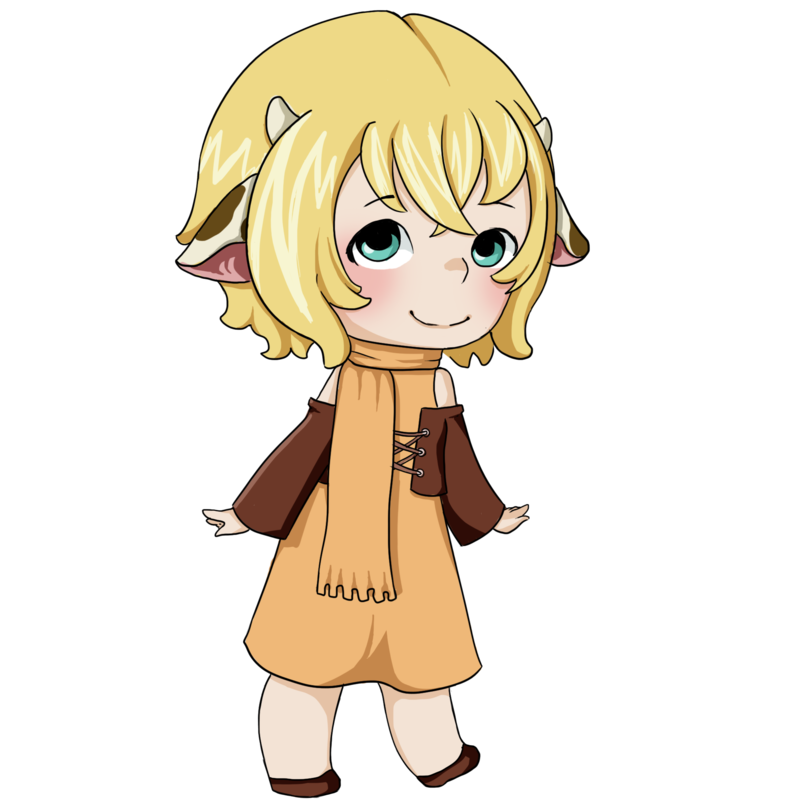 March was also the month of Nanoreno, and I went from Milk to How visual novel changed my life, released in April, without transition. The artists’s work was precisely limited to avoid burnout so the gain was mostly based on text and programmation. Which turned out to be a nightmare… Overwhelmed, I had to infringe upon my on-the-job training schedule in order to finish the script (and integrate the translation, while I’m at it). 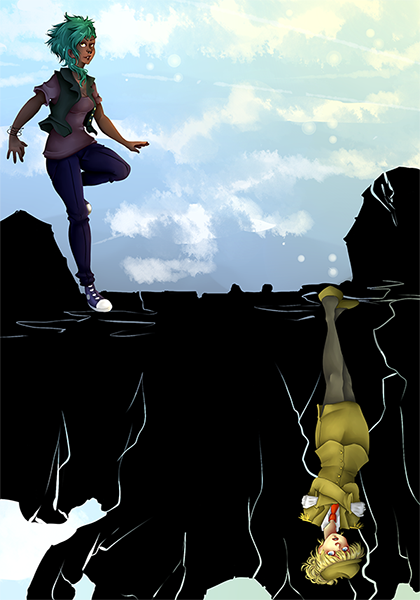 The whole thing with an even moreunpredictable Keul. I copped it, which may explain why the game was a bit delayed. And I thought it would only be a little gift to please our fans. That’ll teach me to do too many things at the same time =’D. Since HVNCML was just a small thing without pretention, I didn’t expect much. So, many month later, I’m really surprised to see people discovering us like that, I sure hope they won’t take fright because of what I wrote XD. Two visual novel in a year is quite decent, except that we never stop. Never. 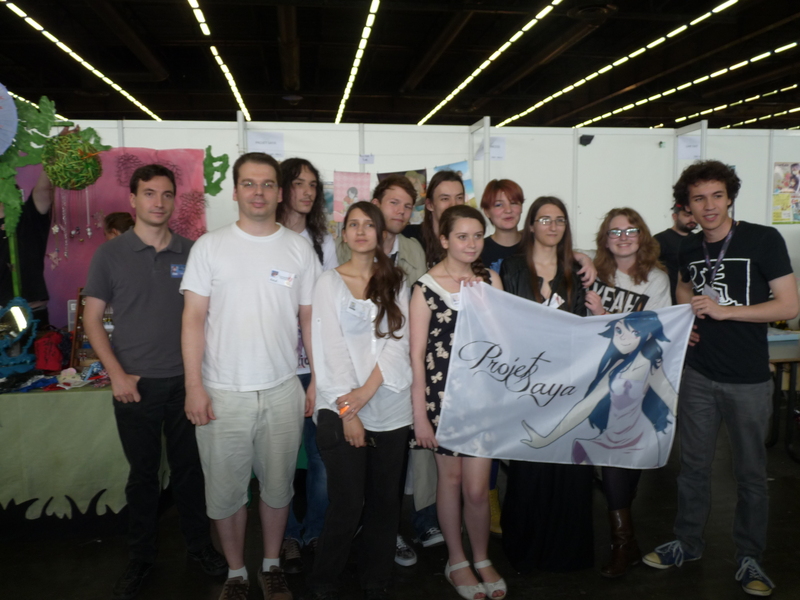 The big project of the year was of course the team going to the Japan Expo convention. I won’t hide hide, it’s tottaly because of the Endless Seasons guys, they have a catching enthusiasm and were looking for people to share their booth with anyway :p. In the end, Projet Saya offered to supervise and we managed to convince Atelier Dreamnoid to join us in this crazy ride. The preparation was huge, no organiser wanted to leave things to chance, so we ask every participant for thei opinion many times in oder to be in the same wavelength. The Träumendes Mädchen team had to finish many things, with the weight of the crowdfunding campaing on our shoulders, like Episode 3 and some goodies. The remakes got added really fast with the success of the first strechgoal. Thanks to our artists, including Orties and Melow who produces most of the drawings between the two of them, everything turned up alright. In the end, it was an enriching experience. For a first time in the convention world, I think the team did a good enough job and it was a pleasure to meet everyone IRL and spend time with fellow developpers. Once again, it should have been enough but we had to give ourselves more work =’D. The summer end was a good opportunity to put webdesign under construction. The old devblog wasn’t suitable anymore, we wanted a real “shop front” and not a messy page. If posisble, the site had to be both in English and French for pratical reasons. The result still isn’t perfect but we’re working on it! Icing on the cake, we tried a new game jam : the Ludum Dare. 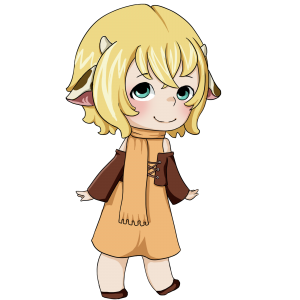 With an even more challenging goal than Nanoreno and a different community, we were assured we need a lot of coffee and wouldn’t get much sleep. Many difficulties made the experience a bit painful on my side (I must be a masochist XD), the team did finish a game in time. Of course, it couldn’t be a big complex one (don’t forget it was done in a weekend) but Garden of Oblivion, published betwee August and September, was the perfect opportunity to male a real game from scratch. We did rely on what we knew well (visual novel) and the result has the same vibed but we learned a lot. 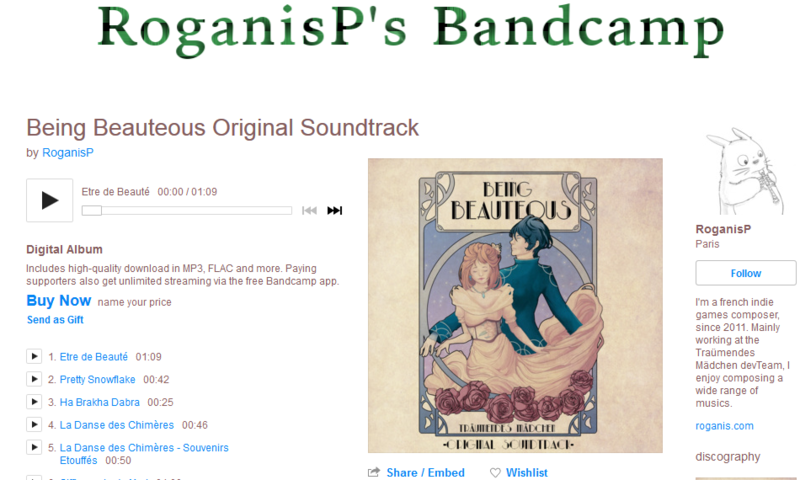 The rest of the year (not much left) was used to progress on Milk Episode 4 and some various little things : like the dematerialised version of the games we sold at Japan Expo, the arranged OST of Being Beauteous by Roganis, a big giveaway, etc. I’ll make another post early January to reveal what we’re gonna do in 2015 (a year as surprising as the last one, I hope), so meanwhile I wish you a merry Christmas. 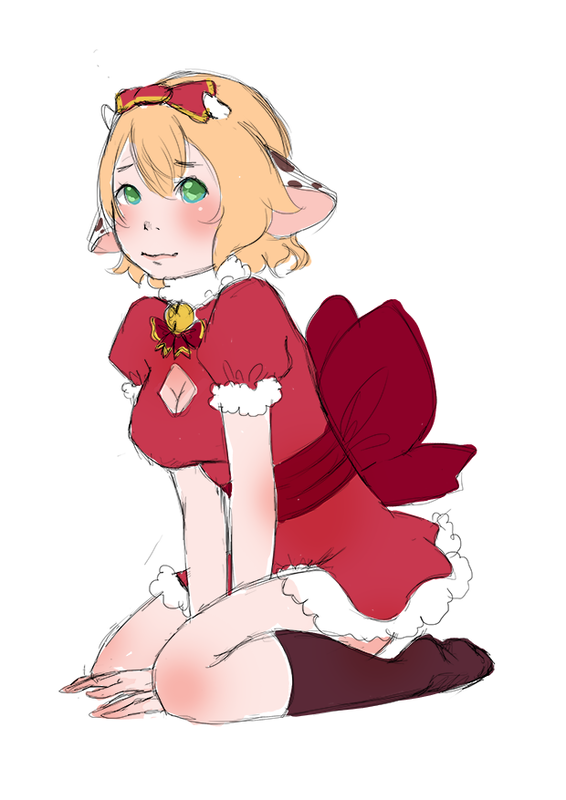 Also, here’s a cute Christmas Miruku by Melow ;). 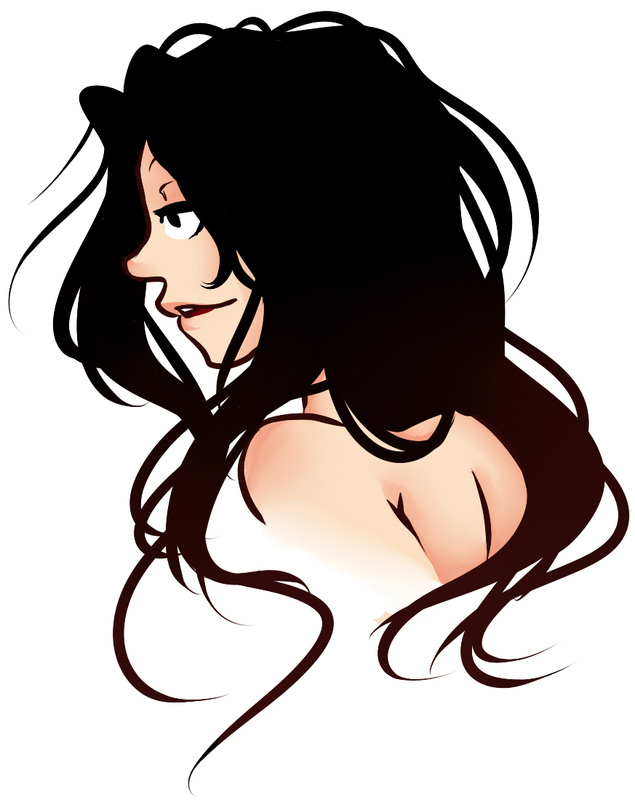 You know who she is: more Khzi’s madness incoming! We’ve been preparing it for some time now, the time has finally come…SHE’s coming back. Oh yes, you know who I’m talking about. 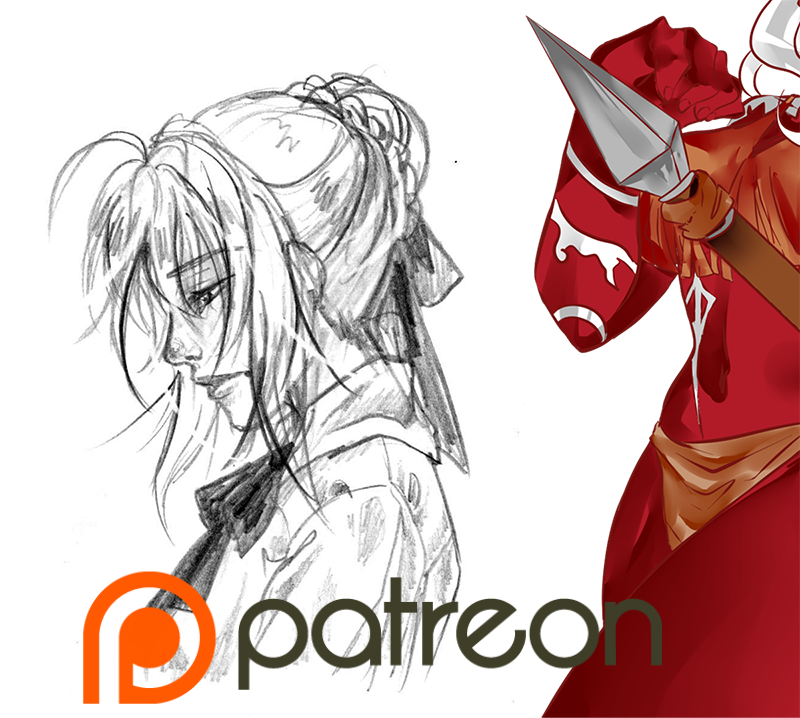 As you must know, we released all of our short projects on Gumroad on « Pay what you want » : the graphic remakes of Being Beauteous and Ambre, as well as How visual novels changed my life are all available for free but you can drop a little tip to support future releases ;). 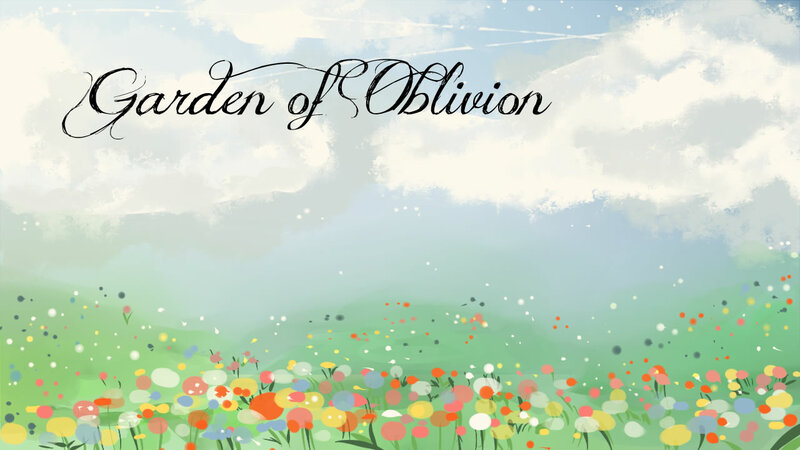 Ludum Dare has ended for some time now, as we have received the ratings of Garden of Oblivion, our entry. For a first time, we didn’t do half bad ! We even got into the Top 100 (at the very end but we made it) ! I’d say it’s a very encouraging sign and we’re gonna considerate entering once more to make another game. Now that those things are out of the way, it’s time for the real deal : Milk ~La légende des étoiles. We’re officially gonna release Episode 3 next week. So why would you care ? The story is now 5 hours long, with various improvements (like a better translation for you, English folks!). Which makes like half of the common route and more Khzi’s goodness ! And I know, you like her very much ;). Who wouldn’t like such an inpredictable fellow whose hobby is to make people go crazy just for fun 8D. 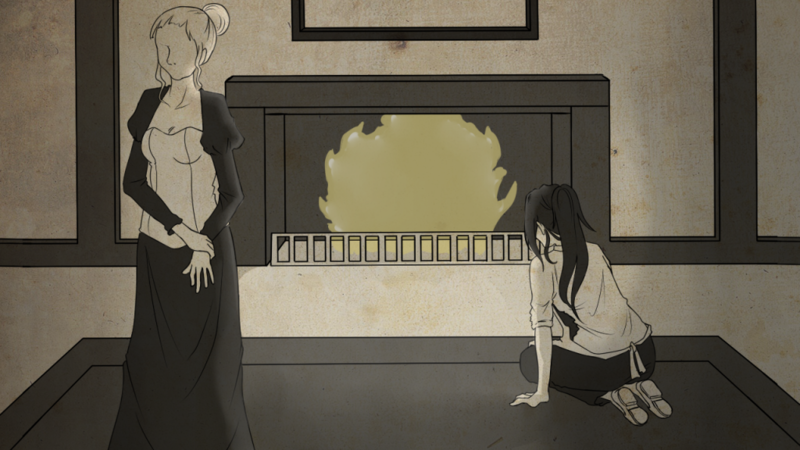 Meanwhile we’re gonna share some extra pictures on social networks to make you want to play our story. So get yourself ready because you’ll finally be able to know what happens after that pirate raid next week ! From 2nd to 6th July, the whole team attended Japan Expo, the biggest european convention around japanese culture (anime, manga, videogame, etc). Being more of the discreet kind, I confess that I don’t go to convention very often, so it was my first time at Japan Expo. 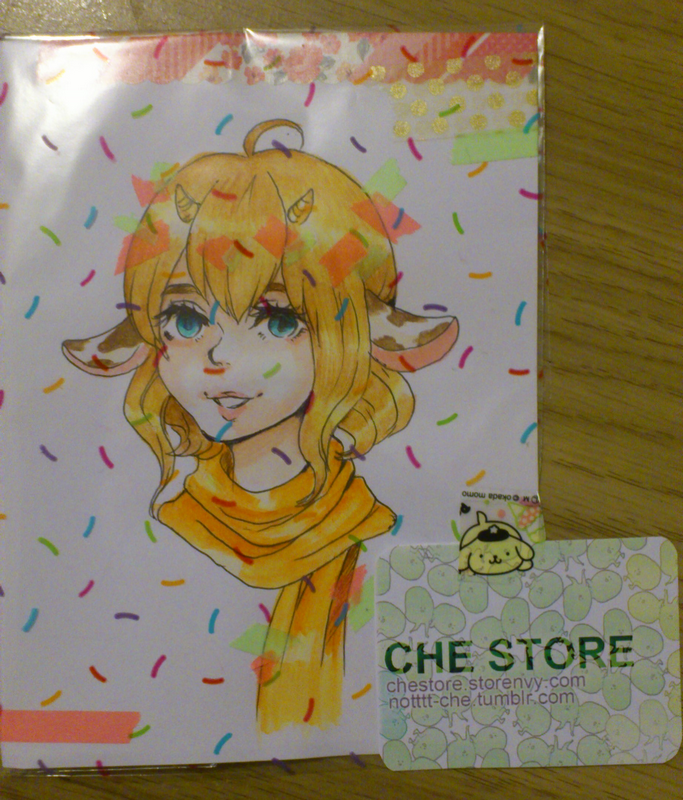 I was very nervous, not knowing what I should expect except a lot of troubles, and starting right off the bat as an exhibitor was scary as hell ! Fortunately, this first experience went well. 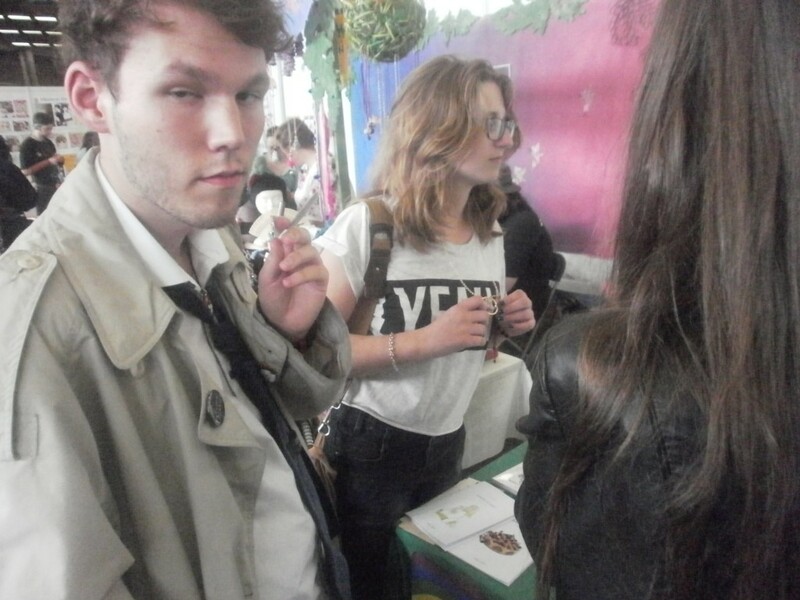 First of all, the atmosphere behind the Projet Saya booth was very enjoyable. 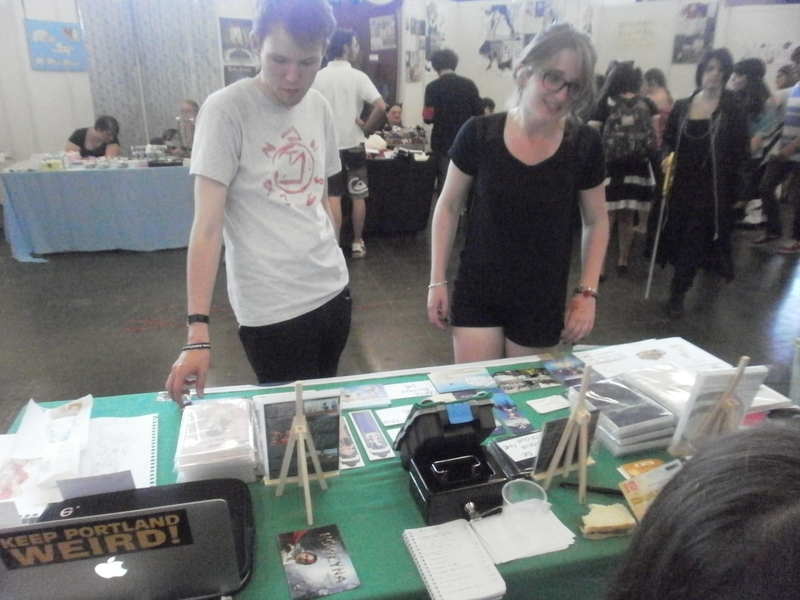 We were many people : the Swiss team Endless Seasons, the organiser from projet Saya, a good ten or so of the Träumendes Mädchen team (luckily never at the same time) and Atelier Dreamnoid at the end of the week. Being that much people was clearly a weakness in terms of comfort (not many chairs, not many place for everyone’s bag, the back of the booth being a real mess) but is was a real strength in terms of motivation. Everyone was taking turns to manage the booth, so you could take break whenever you wanted to rest or go take a look at the convention. Since an exhibitor has to wake up early in the morning, stay up all day long with the crowd and noise all around, and go back late in the night, needless to say we were all soon tired. But thanks to our number, we managed to stay awake and energetic throughout the week, which is kinda miraculous ! Besides, we were united and there was always someone to chat or clown around to lighten the atmosphere. In brief, it was very enjoyable to be a part of a motivated and welcoming collective. Our booth was decently located : we regularly had visitors stopping in the amateurs area to look around. The people on the booths next to us were all adorable and put ut with our constent babbling. Roganis, our composer, also befriended the booths in front of us that were selling doujin music : Butterfly Odyssey, a French group doing celtic music and seam ( he bought himself a soft cat paw) and Showdo Records, a Japanese group that was very kind (Melow gave them some little sketches as a gift). It was a real pleasure to talk with them and we’ll be sure to greet all of them if we come back to Japan Expo. Even the visitors were all super nice to us ! 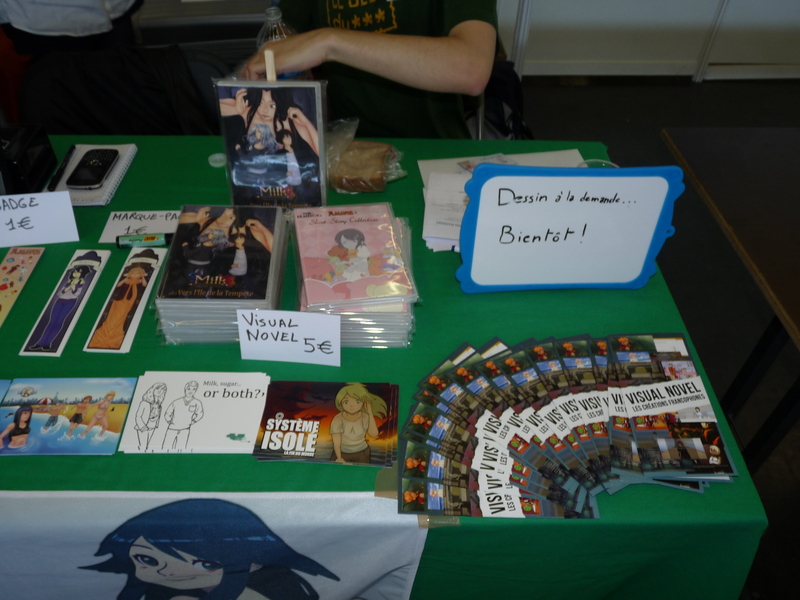 We were attending the convention to promote the creation of visual novel and not to make a lot money, so we simply were happy to talk about what we liked. It was interesting each time : with people who didn’t know what this was about, we shared our passion for visual novel, and with accustomed people, we exchanged about our favorite games. A bunch of Nitro+ fans came to us because of the banner referencing Saya no Uta BTW ! I think our honesty was showing because a lot of visitors actually listened to our speeches XD. It was heartwarming and we didn’t expect that much interest. Some visitors even spoiled us : there was a girl that showed up to offer us handmade cake and a man let us a little tip. 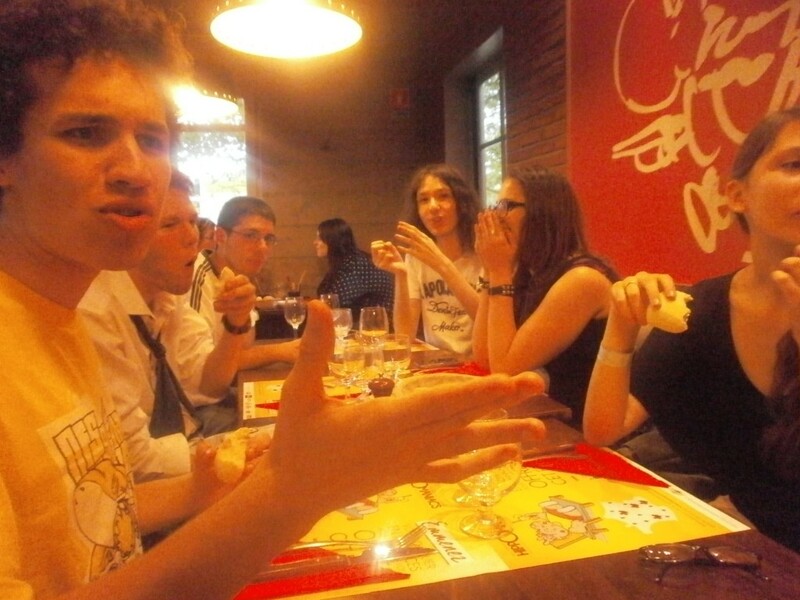 Being able to discuss about visual novel with Polish guys was also super cool and we hope to see more foreigners next time. The biggest surprise we encountered was the little success of our products. We never attended any convention before, so we came expecting the worst (even if Endless Seasons and the organiser from Project Saya had both experience which was reassuring). In reality, all physical copies sold well so much we were out of stock Sunday evening (hard copies for the Indiegogo’s backers were of course booked, they’re not affected). Roganis music album sold well too. On the other hand we didn’t print enough leaflet and quickly lacked stock, we’ll have to correct that mistake another time. In the end, only the goodies are left since they didn’t sell that well. Some people could call it a failure but that’s not our opinion. Goodies bring some colors and fill the space (a booth with only two things on sale would be sad), plus they flesh out the world we’ve created. Most visitors didn’t know our visual novel before, so it’s natural that they don’t want to buy goodies of an unknown story right off the bat. But, if they enjoy their read after discovering us, mayve they’ll be interested next time. Those goodies aren’t gonna go to waste, they’re part of a long-term strategy and we won’t print that every year (would be way too expensive !). 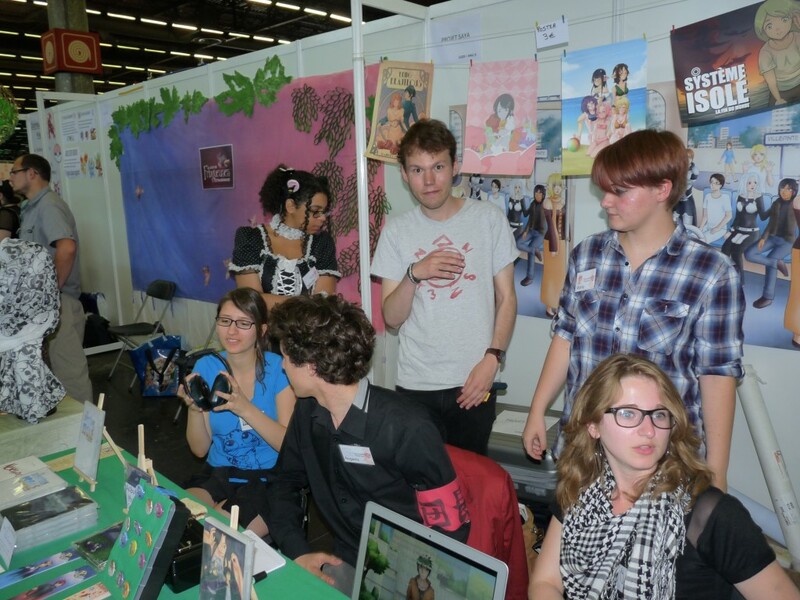 Apart from managing the Projet Saya booth, I didn’t really get the chance to visit Japan Expo. The only event I got to see was the Kalafina live. Fans were so on fire, they applauded each time they could (in any instrumental break of any song, for example). I would have appreciated more songs from their first albums but I expected that they would focus on their newest and I was delighted when they ended the live by singing Sprinter. 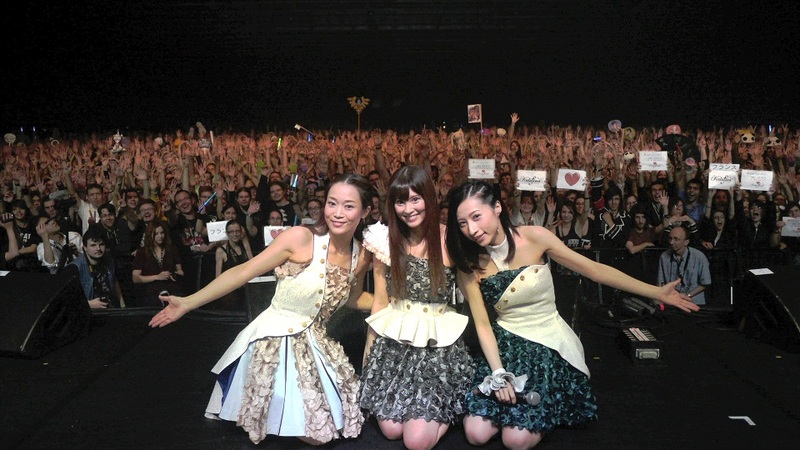 I hope Wakana, Keiko and Hikaru liked they stay in France. While a part of the team was attending the concert, another part went to Oyari Ashito’s signing session, a famous artist that illustrated several visual novel (with lots of lolis :p). 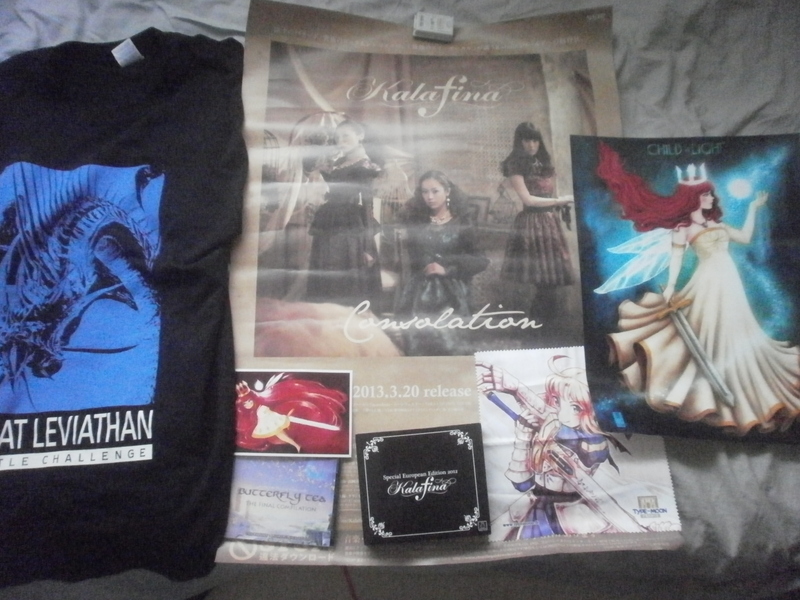 * The Kalafina European Edition which includes their first albums and a promotional poster. I would have loved to get that album signed but I didn’t get the chance. * A music album from Butterfly Odyssey. I actually heard of the composer for a while and I really wanted to get one of his work. * Child of Light fanarts ! I really wanted to buy goodies on the amateurs booths to support them but I confess that I don’t really watch the most recent animes (like Kill La Kill, Free or Shingeki no Kyojin). So I went for the most recent thing I knew and liked : Child of Light (I love that game XD). Want to see more pictures ? There are some on the last update from our Indiegogo page and we posted a whole album on Facebook with descriptions. Your comments are welcome ;). It’s on starting blocks that the team is delivering to you the latest news before Japan Expo 2014. And, to start off on the right foot, here is our promotional visual ! Last time we told you all the orders had been send. 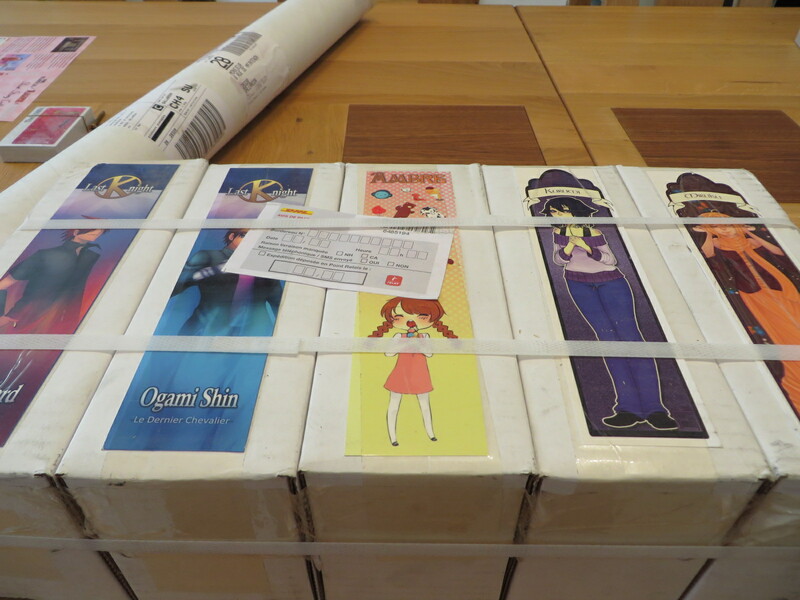 In the meantime Projet Saya received the packages and was kind enough to take some pictures to satisfy our curiosity. Here is a sneak peek, I hope you’re drooling as much as we do XD. In addition to the goodies sales, we really want to make the most of our talented artists. Roganis won’t be able to bring his music instruments as planned, due to technical issues, but our three lovely designers will make drawings on request. Morsy will only be there on Thursday and Sunday, whereas Melow and Orties will be there the entire week. Don’t hesitate to ask them ! Since Projet Saya has a camera, we won’t forget those who can’t go to the convention ! If you follow us on social networks (Twitter, Tumblr and Facebook), you’ll be able to see us clown around live XD. 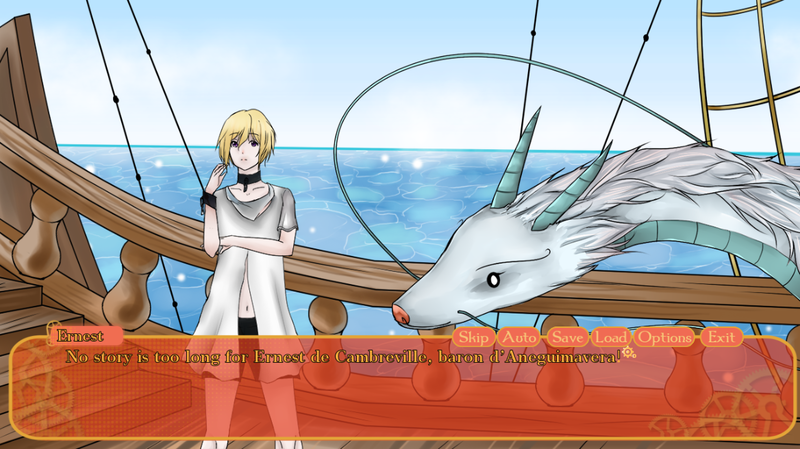 Japan Expo is coming soon, so let’s give some news about what we’re preparing for this event ! Spoil : a lot of things (as usual). Items have been successfully send to be printed. Among the various stuffs we already showed you, there is one we hadn’t finish at that time. Indeed Morsy couldn’t find the time to do the last bookmark so Orties had to take care of it in her place. Here’s the result, I hope you’ll like it ! The other thing is about the music album. It was intended to allow you to fully appreciate Roganis’ work but we also thought about making it a Milk OST, which wasn’t a good idea given that we haven’t finished the game’s music yet. So, all things considered, Roganis finally made up his mind and produced the following tracklist for The Milky Way of Music ! The music album will have 13 tracks including a good amount from Milk (all episodes mixed up, even those that haven’t been released yet) or Träumendes Mädchen’s games, but also some covers and an original one. The first edition will be printed in very limited numbers and a lot of people already reserved their copies during the crowdfunding campaign, so there won’t be much left. If you’re interested in having one, please do tell, so that we know in case we’ll have to produce some more copies ! Good news : the game is almost finished. We only have some programming to do and Episode 3 will be available for the convention. We took that chance to completely remake the textbox (from the old GUI) and enhance Episode 1 translation that wasn’t on a par with the rest anymore. Yet, having to deal with some withdrawals, we find ourselves very short to finish Episode 3 English translation. We’ll do everything we can in the remaining time but we might not be able to finish it on time for those attending the convention. We’re crossing our fingers ! Since we met the first strechgoal of our Indiegogo campaign, we’re working on a compilation that will include all of our little projects. Being Beauteous is currently receiving quite the makeover ! Roganis remade his old tracks and some new ones to enhance the sound experience while we’re doing a brand new GUI inspired by Melow’s poster. We’re also redoing all of the CGs to stick to the new size (1280×720 instead of the old 1024×768) and ofer a more polished experience. 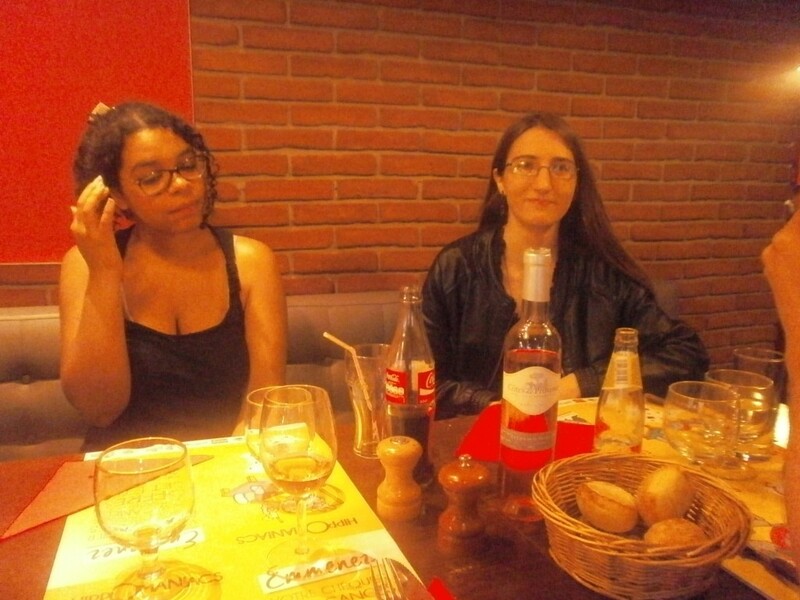 Since Morsy didn’t have the time, Orties once again took care of the art and her style is of course very different. We tried to stick to the original spirit and we hope you’ll like the new graphics. 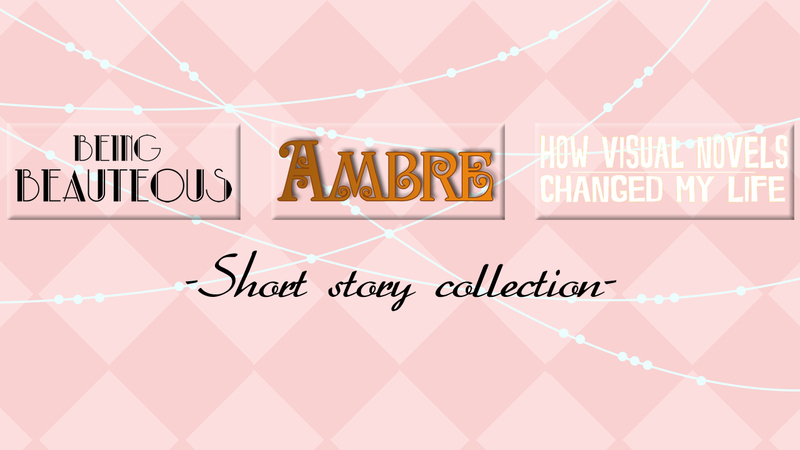 As for Ambre, as promised we’re redoing the translation. 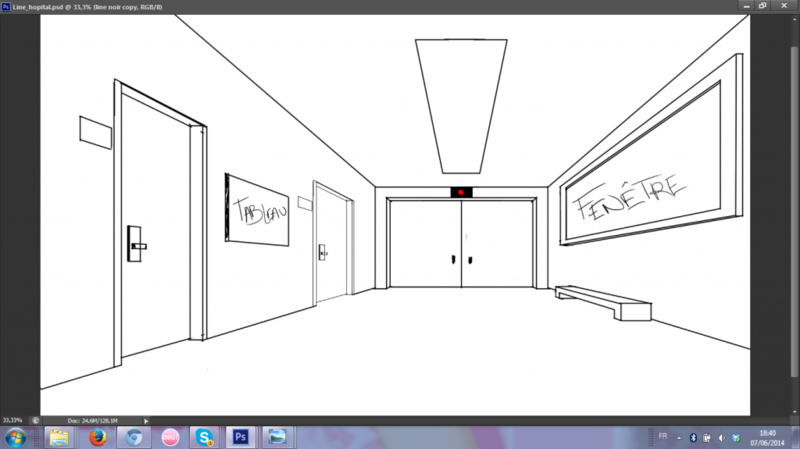 We’re trying to enhance some backgrounds as well, as you can see on Melow’s sketch. However we’re experiencing issued with How visual novel changed my life. We wanted to add some extra scenes but we’re finding ourselves overwhelmed by the workload. Since it’s our more recent game, we’d rather focus on improving the old ones and won’t be able to deliver the extra scenes. We’re deeply sorry for the inconvenience. Our schedule before Japan Expo is tough but we have a lot of energy to burn and we really want to please all of our fans =). 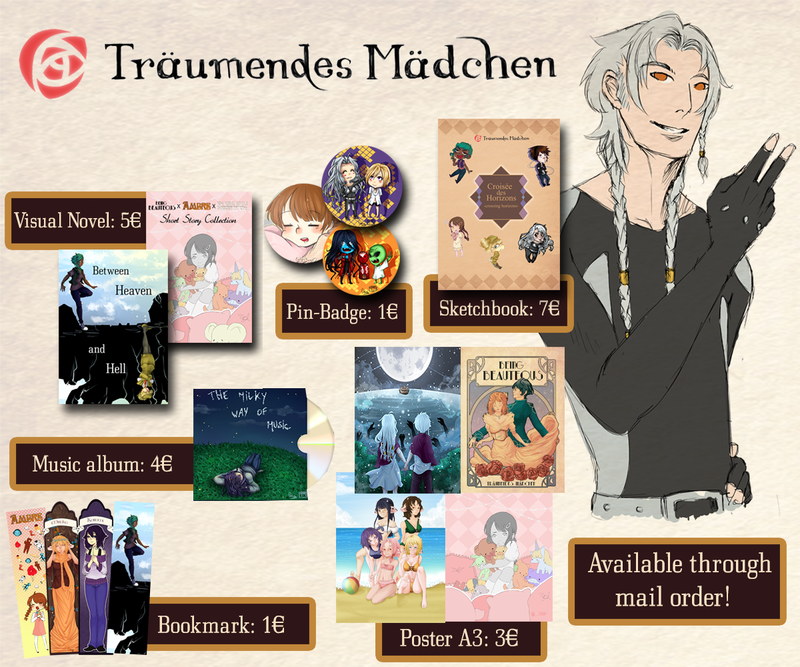 On a very different subject, the Träumendes Mädchen team is finally getting a real website. The devblog has become inadequate and we want browsing to be easy. Modifications are to be expected soon, we’re keeping you informed ! 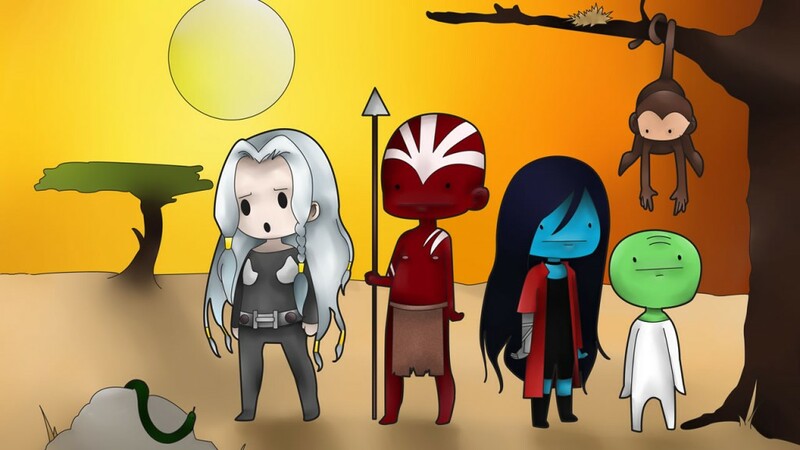 The whole Träumendes Mädchen team is very proud to announce that we’ll be at Japan Expo 2014 from 2nd to 6th July ! For a long time we were hoping to come at a convention in an official way and that’s now a reality. You’ll be able to find us at our booth to discuss our various projects, chat or enjoy our fabulous artists : our composer will improvise some music and many designers will do little illustrations on request. If you’re passing by, go visit us, we’ll be very happy! 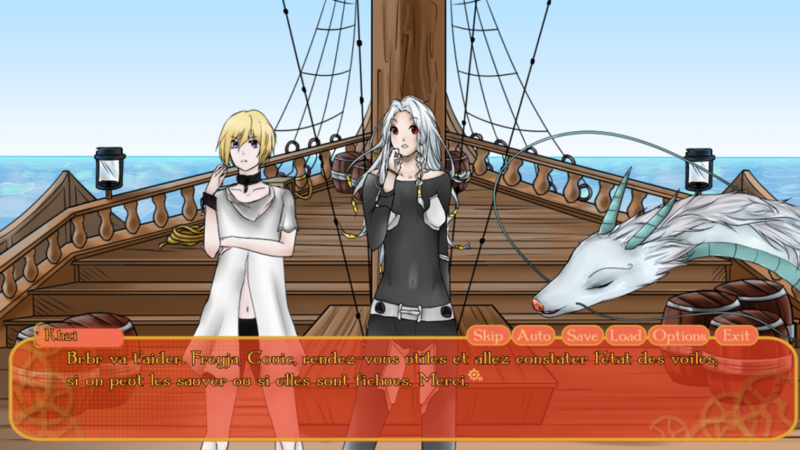 Those who read How visual novels changed my life, our recent Nanoreno project, must have understood by now but we’re planning to come to japan Expo with something for you. Indeed, as exhibitors, nothing would please us more than to offer our fans some goodies. 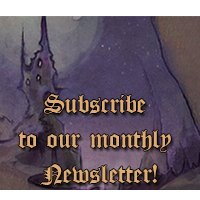 The thing is, we’re too poor to afford it by ourselves, that’s why we teamed up with Atelier Dreamnoid and Enless Seasons, two others visual novel creators, to gather our ressources. With the help of Projet Saya who kindly proposed to take care of logistics. We just launched an Indiegogo campaign to collect the funds we need to go to our first convention together. 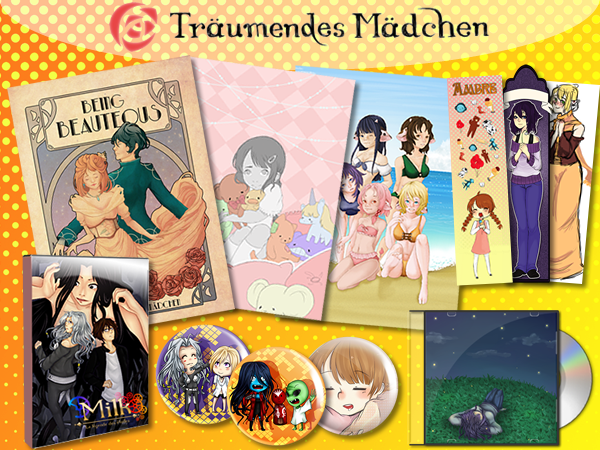 Here, at Träumendes Mädchen, we’ll be offering some goodies : three designs for posters, three design for pin-badges and three designs for bookmarks (the last one isn’t finished yet) for our different games (Being Beauteous, Ambre and Milk). 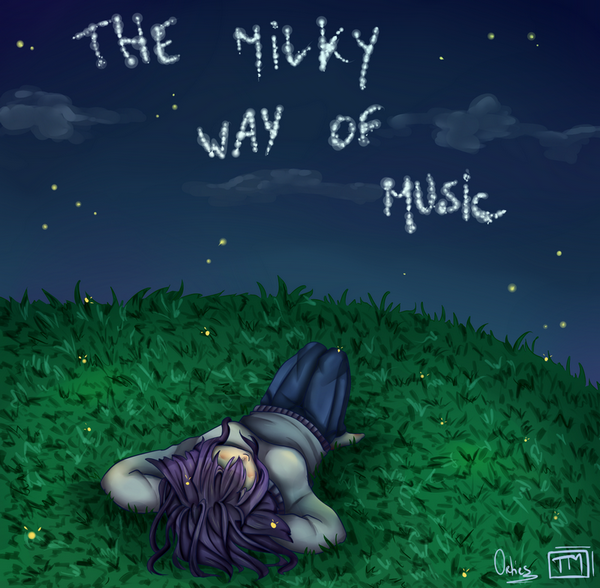 There will also be a music album composed by Roganis (we’ll be showing the tracklist sometime soon) as well as physical copies of the first three episodes of our visual novel Milk. This edition will feature technical improvements over the online version, a new illustration for the main menu and the exclusive episode 3! 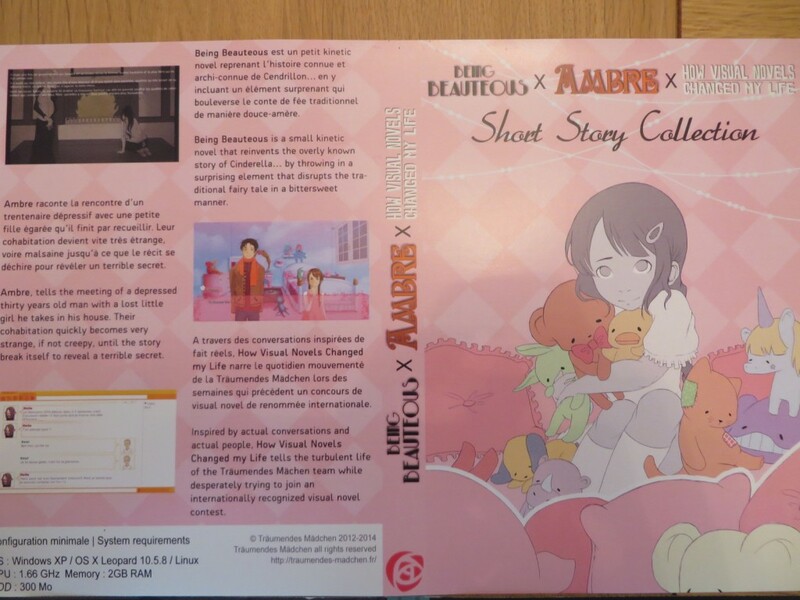 Indeed, the lucky owners of the physical version will have access to the story as soon as early July while the others will have to wait until the end of summer. If the initial goal is met before the end of the campaign, we’ll be offering even more choice! With the first stretch goal, we’re going to produce a re-mastered compilation of our short projects with improvements here and there : How visual novels changed my life will include additional scene with new extra illustrations, the translation of Ambre will be enhanced and we’ll redo some of the backgrounds, where Being Beauteous will receive a new GUI (with some graphical enhancement if we still have the time). And with the second stretch goal, we’ll have twice as much goodies to offer! So, if you liked our work or if you want to support the western visual novel creation, don’t hesitate to pre-order on our Indiegogo campaign, even if you’re not coming to Japan Expo : we’re shipping products, with additional fee sadly. Even the simplest donation will be helpful. The whole team is counting on you ;).